Where does Blue Green Algae come from? Blue green algae comes from the Pacific Northwest. It is a wild harvested organic certified single celled organism which occurs in the remote area in the Pacific Northwest. The Pacific Northwest enjoys some of the cleanest air on the planet and happens to have the perfect natural lake for growing and harvesting USDA Certified Organic Blue Green Algae. Nestled in the shadow of pristine Crater Lake and fed by more than seventeen natural springs of astonishing beauty, Klamath Lake is the largest (by surface area) freshwater lake in Oregon. It is one of the cleanest and purest bodies of water found in North America. Crystal clear mineral springs fed underground from Crater Lake supply Klamath Lake with a wealth of minerals resulting from a thick layer of volcanic ash. Only the perfect natural ecosystem of Klamath Lake offers a unique algal species the habitat that it needs to flourish. The extremely volcanic mineral rich geographic region, the intensive solar energy of the high elevation and the constantly moving, oxygen rich crystal clear waters, make blue green algae (Aphanizomenon Flos-Aquae) or (“invisible flower of water”) one of the most nutrient-rich abundant whole green foods on the planet. What is so special about Blue Green Algae? It is the purest, most nutrient intact algae available in the world. Aphanizomenon flos-aquae (AFA) Blue Green Algae is widely agreed to be the most ancient food on earth. It is one of the few edible microalgae, and it differs from other microalgae grown in ponds, such as Spirulina and Chlorella, because it grows wild in an optimal environment. This allows it to develop a remarkable nutritional profile. At the bottom of the food chain, blue green algae is the most nutrient-rich food (ounce for ounce) known to be created by nature. This simple organism is complete nutrition in its most basic form and is a superb natural source of nutrients for the body, including topically! 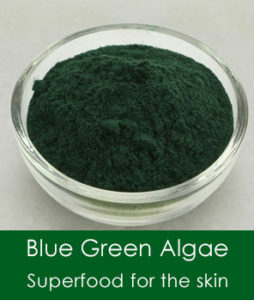 Before we dive into the benefits, it’s important to point out that the Blue Green Algae that we use in our products arrives at our lab as food grade, however, because we are a cosmetic manufacturer once we receive this into our lab it is immediately considered to be a cosmetic and not for human consumption. In particular, its high nutrient density and the synergistic effect of the trace nutrients it contains makes blue green the ultimate superfood. It also contains all essential and non-essential amino acids in a proportion which is identical to the human body. But wait, that’s not all! It contains a complete and balanced spectrum of vitamins, including the vitamin B spectrum and high quality vitamin K.